With 2,100 kits sold in more than 34 countries, Lancairs are known as the epitome of high performance experimental aircraft. With various models to fit any pilots’ needs, the all-composite La ncair aircraft are sleek, fast, and most importantly, fun! Founded by Lance Neibauer, the first Lancair prototype, the two seat Lancair 200, flew in 1984 and the kit entered production in 1985. This was soon followed by the Lancair 235 in 1986 with an extra boost of power and then came the Lancair 320 and 360 series. These Lancair series are no longer in production. Pilots looking for a two seat Lancair featuring the speed they are known for need to look no further than the Legacy Aircraft series. The Lancair Legacy can be equipped with 210 or 310 horsepower engines and in a fixed gear or retractable gear configuration. Lancair Legacies boast speeds of 250mph while only burning 14 gallons per hour. For more daring pilots, the RG-550/R Lancair option is available for Sport and Super Sport Air Racing. Pilots looking for a four seat Lancair aircraft can opt for the Lancair ES, Lancair ES-P, the Lancair IV, Lancair IV-P and the Lancair Propjet. The Lancair ES is tricycle gear and reaches cruise speeds of 215mph with its 310hp engine. The ES-P features the same exhilarating speeds while offering a pressurized option. A twin turbocharged 350hp power engine and retractable gear help the Lancair IV and IP’s hit speeds of 253mph. A Lancair IV, N6ZQ, is currently pending a new speed record for its recent flight around the world in just over 24 days. Replace the engine with a 750 horse power Walter M601E turboprop engine and you will have the Lancair IV’s predecessor, the PropJet. Propjet pilots can fly far with cruise speeds of 375mph at flight levels and a climb rate of 4,000 feet per minute. 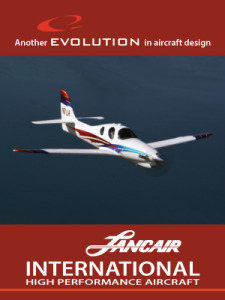 Deserving a paragraph of its own is the Lancair Evolution. Built with certified aircraft standards in mind but with the speed Lancair is known for, the pressurized Evolution cruises at 345mph. With a stall speed of only 61 knots make handling a very powerful aircraft more safe. Lancair went certified in 1997 under a new company, Columbia, introducing the Columbia 300 in 1998. The Columbia 400 followed two years after with an all glass cockpit. Later, the aircraft was sold to Cessna and renamed the Cessna TTX. Lancair Builders/Restorers Risk Insurance: AIR offers a builders and restorers insurance program designed to protect the aircraft during the building or restoring stage regardless of pilot experience and qualifications. Customized with your needs in mind, this new insurance plan offers flexible liability and hull coverage options. Current and Potential Lancair Owners: The aircraft insurance experts at AIR shop all of the major aircraft insurance markets to provide Lancair owners with the best available rates. Just one phone call to AIR will save you both time and money!